Some cool gear arrived at the office on Tuesday: new MacBook Pros and the new Flir One ($349) thermal imaging camera for the iPhone 5s. Macworld Lab set up the laptops for benchmark testing, so I took a few pictures of the new $2499 15-inch MacBook Pro as it churned through Speedmark 9. I originally posted these pictures to Twitter, but I collected them here as a point of reference and for folks who don’t follow me on Twitter. The Flir One doesn’t rely on the iPhone camera at all, and it has its own battery to power the thermal imaging camera—the battery doesn’t provide a charge for the iPhone. The app provides different shading schemes that you can switch by simply swiping across the app. You can change the scheme while you’re framing the shot or after the shot has been taken. While the $2499 MacBook Pro was running a graphics test, I took a picture and posted it to Twitter. I used the Flir One’s "Rainbow" color scheme. The warmest spots are indicated in red. I also took this picture, which used the Flir One's "Hottest" color scheme. 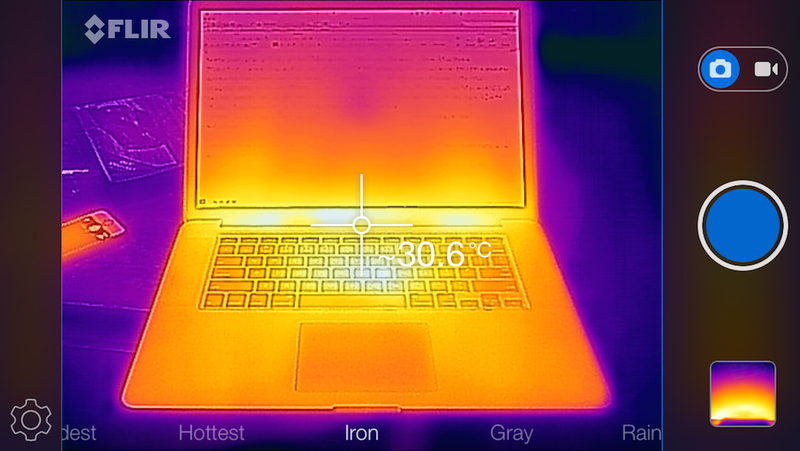 The red spots indicate the warmest spots on an open MacBook Pro. 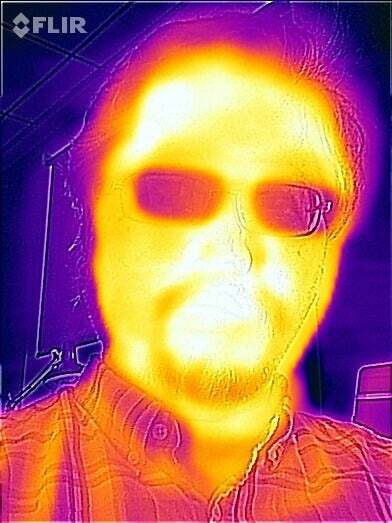 @pinatubo2000 @macworld @FLIR_ONE first impressions? Temperatures? Which reminded me of the Flir One’s spot meter. 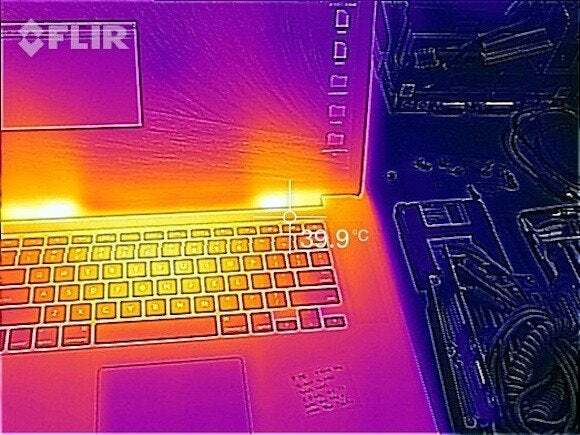 When you point the Flir One’s hashmarks at an object, the object’s surface temperature appears on screen. The spot meter isn’t on by default; you flip it on in the app settings. After I turned on the spot meter, I took this pic. Flir One has a spot meter that can determine the surface temperature of an object. 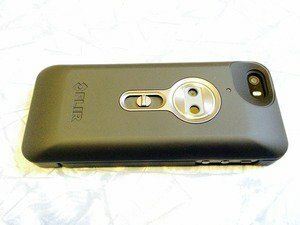 According to Flir One, the spot meter has a plus/minus rating of three degrees Fahrenheit, and the most accurate readings come when an object is within a meter of the camera. 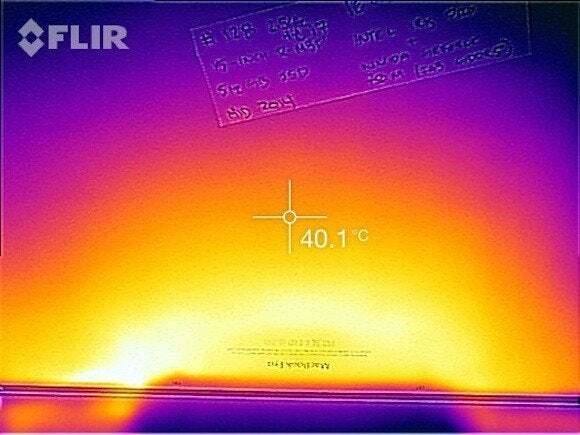 @pinatubo2000 @macworld @FLIR_ONE @jsnell Would be interesting to see the other side, the side that roasts your bits when playing Flash. So I took this picture of the bottom of the MacBook Pro while it was running a benchmark test (but not a graphics test). The back of the new $2499 15-inch MacBook Pro. 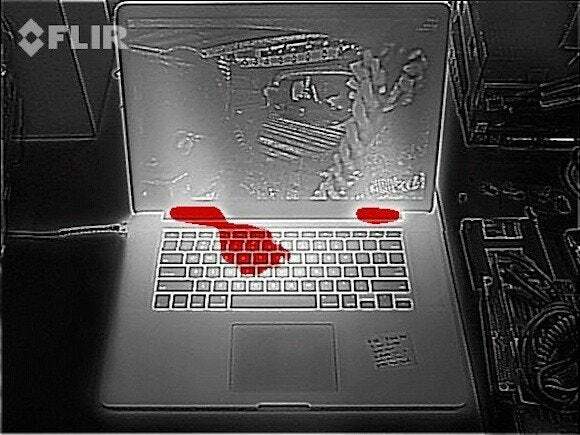 The actual first pic I shot with the Flir One. A selfie. How clichéd of me. Macworld Lab is also testing the 13-inch $1299 MacBook Pro and the 13-inch $1799 MacBook Pro Look for a full review coming soon. I’m performing more tests with the Flir One, including some in-the-field tests while camping next week. Check back for more details on the Flir One and a full review.